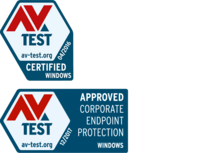 AV-TEST seals are the sign of certified security. These seals of approval are only found on products that, after comprehensive tests, have been confirmed by AV-TEST Institute as complying with the high security levels when tested. 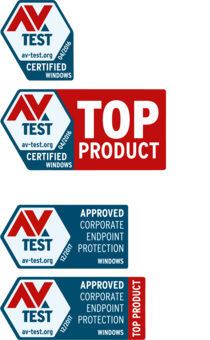 Home-user products that meet the high certification standards of the AV-TEST Institute are awarded the AV-TEST CERTIFIED seal of approval. The AV-TEST APPROVED test certificate is reserved to products from the corporate solutions world. All market-relevant products for the Windows, MacOS and Android operating systems are evaluated. Protection reflects the results of tests involving protection against malware and other attacks. Performance demonstrates the influence of tested products on the speed of the test systems. Usability indicates disturbing influences of tested products due to false alarms and possible limitations in using the Internet. Features provides information on the selection of additional protection functions of a tested product. TOP PRODUCT label for outstanding products from an overall point score of 17.5 points. 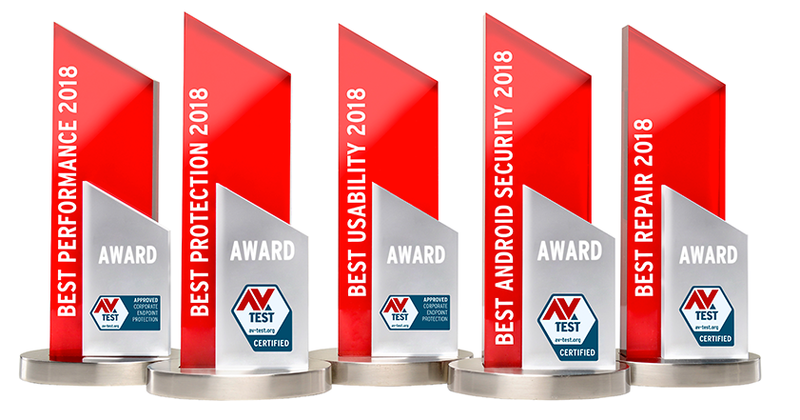 At the end of a complete year of testing, the AV-TEST Institute recognizes the best products in the respective categories of PROTECTION, PERFORMANCE, USABILITY, REPAIR and ANDROID SECURITY. AV-TEST presents these awards in order to honor especially effective anti-virus products that offer performance that contributes towards establishing current standards in the field of IT security and play an influential role in the area of prevention. Security tests of networked devices require a complex approach. The object is to reflect the overall data security picture of smart home and IoT devices, as well as connected online services. In addition to the certification tests for IoT and smart home products, AV-TEST regularly carries out tests of especially market-relevant products. By doing so, AV-TEST is contributing to the selection of secure IoT products for consumers. These tests with a reduced testing scope involve a regimen to evaluate encryption, authentication and protection against attack. The tested products' level of protection is indicated by stars on the test label. Three stars are the maximum point score a product can receive.